For a classic Christmas light look with an updated flair, our C9 LED bulbs are a stunning addition to your holiday decor. The rich color draws the eye to your house roofline and fencing. Consider adding even more richness by outlining your windows, doors and porch railings. LED bulbs are an energy efficient choice and have virtually no heat output, so use them with confidence in large quantities. 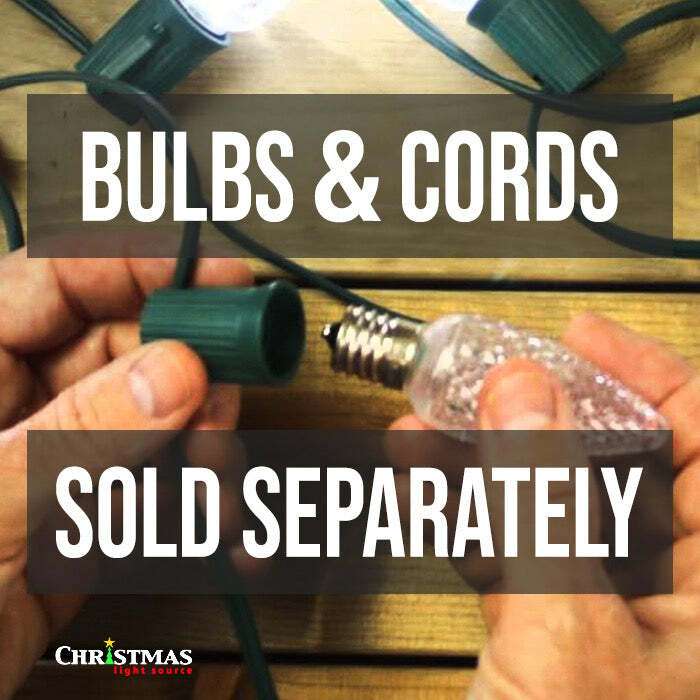 When placed in your 25, 50, or 100-foot cord, purchased separately, they can be used in both indoor and outdoor applications. And remember your Christmas tree! Blue C9 LED bulbs are glorious in indoor usage. Use as a single color for that blue, blue Christmas, or consider combining with other colors such as white or green. Note for Operation: This bulb is for static displays only. Animation will instantly damage this bulb - "pop it". This item cannot be dimmed. See our dimmable C9 bulbs if you are planning to use your bulbs in an animated display. Virtually unbreakable, colors will not fade or peel. Bulbs use up to 98% less electricity while remaining cool to the touch. Retro-Fit, Smooth. 5 LEDs per Bulb. I'm upgrading to C9 LED lights, how do I choose? What is the difference in LED and incandescent? We just got our old smooth lights changed out to these blue LEDs. They are soooo bright and beautiful! Now ordering some of the color changing LEDs to line the driveway! Q: Silly question, as I do not know what E17 base means, are these threaded base or pop in? Thank you. A: First, there are no silly questions! I know that if you are wondering about this, there are others out there who have the same question. An E17 base is a screw-in base not pop in. A bulb with an E17 base looks like a night light bulb on growth hormones - just a little larger diameter. This type of base is also known as Intermediate.